One day while sitting in class in a Cornell University schoolroom, [Will] and [Michael] thought how cool it would be to send text messages to each other via their Texas Instruments calculators. Connecting the two serial ports with a serial cable was out of the question. 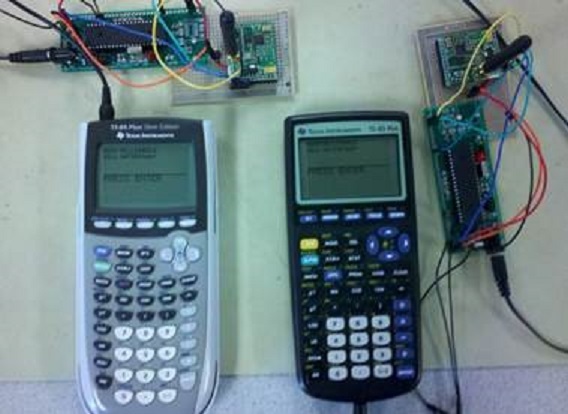 So they decided to develop a wireless link that would work for both TI-83 and TI-84 calculators. The system is powered by a pair of ATmega644’s and two Radiotronix RF Modules that creates a wireless link between the two serial ports. The serial ports are 3 wire ports, which can be used for several things, including acting as a TV out port. [Will] and [Michael] reverse engineered the port’s protocol and did an excellent job at explaining it in full detail. Because they are dealing with the lowest level of the physical protocol, there is no need for them to deal with higher levels like checksums, header packets, ext. Be sure to stick around after the break to see a video of the project in action. It’s quite slow for today’s standards. If you have any ideas on how to speed it up, be sure to let everyone know in the comments. I would give my left testicle for that level of integration with no externally visible parts! I wonder how much empty ‘cavity’ space exists in that calculator, maybe it’d be possible to do create a low-profile PCB layout on flex for short-range comms… Say with an XBee or similar RF radio and a lead-less microcontroller package like QFP. After seeing the commercials I asked one for Christmas, thinking it was going to be the next big thing. I ended up being the only person I ever met that owned one. My brother and I had them. We were the only ones who did. It got played with for a good 6 months between us, then he lost interest and I discovered the SDK. They had RS232 ports, so I wrote a relay program that would let me have a wireless serial port bridge, I ended up getting 28800 baud out of it. I ended up using it to take a Palm IIIe wireless with email and a browser around the house before we had 802.11b devices. It worked pretty well but it was a pain to carry around two devices and a cable. Where was this project when I was in highschool 17 years ago? When I was in High School (graduated ’03), a bunch of us made IR adapters in shop class so we could chat with each other during math. It worked great until an English teacher got suspicious about how much her students were using their calculators in her class. Make a copy of the hard cover, with the wireless equipment shrunk down and molded into it. Done right, the mode would pretty much be invisible with calc in hand or even resting on a flat surface. Graphing calculator? That kind of thing took up a largish room. My high school had a policy of wiping all the calculators before any tests, much to my chagrin, since this often meant the loss of complicated, hand-coded basic programs. So I wrote a program in assembly that emulated the shell of the calculator pretty perfectly, except for the memory wipe not actually working, despite displaying the success message. Unfortunately by senior year the administration had caught on to cheats like this, and invested in a ‘master’ calculator from TI that did something to ‘hide’ your programs in memory when connected to the serial port. It was supposed to unhide the programs when reconnected after the test, but I quickly learned that was anything but reliable. Never got around that, but by then I had my own serial linking cable, so I could backup my programs to my laptop. The policies against calculators are so stupid, I am against communication with external sources but having the knowledge to use tools to beat a well designed test should be the real test, not how much you can remember from the book. Luckily our administration had the same policy, but never caught on to my scheme. I also wrote a program that drew a look-alike copy of the program window showing no programs. I think I lucked out as I was the only kid who had a TI-89, so the teacher knew less about it than everyone else’s TI-82s and 83s. Damnit that’s cool. Have another comment in the queue hue hue, but can’t contain myself! Bravo guys! Could this be done with Bluetooth modules and no microcontrollers? I guess pairing without interface and doing the configuration to work as a serial interface would be quite tricky. Well, as to the pairing, my Wii and Wiimotes pair just fine with a couple of pushbuttons. But, you have a point on the serial part. The site finally loaded and I noticed the TI calcs use a non-standard serial protocol, so I assume a microcontroller would still be needed, anyway. This isn’t that cool, really. If they had used Doors’ CalcNet2.2 and made that wireless, then I would have been much more interested. they could have had the entire class in a group discussion. but, as it is only a direct connection, there isn’t too much you can do here. Ho-Hum. Luckily, we, real engineers (not schoolboys) use HPs.. In High School (Class of 97) I built a wireless RF link for TI-92’s (the big square computer looking thing)/ TI-85’s for some friends (in different math classes than myself) but jammed it and then disabled it after finding out they were using them for cheating.